BMW’s Canadian dealers are having no problems getting people into the brand new X1. Slightly smaller than the recently redone X3 and only slightly less expensive, the X1 improved its sales total from 105 in April to 298 in May 2011. Year-over-year, X3 sales jumped 19.5%. The more popular Mercedes-Benz GLK was up 17.3%. 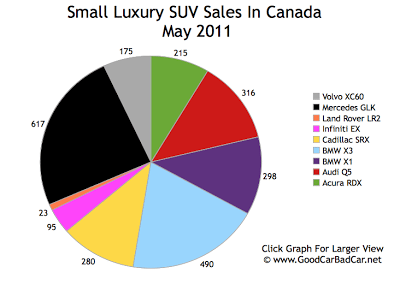 The next-best-selling vehicle in the small luxury SUV segment was the Audi Q5. It posted 29% gains. 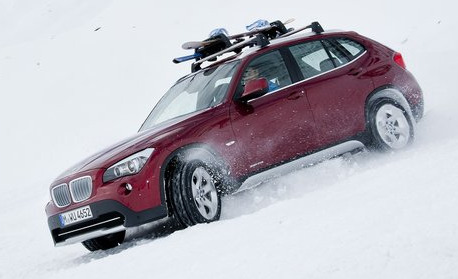 Not yet available in the United States, and perhaps not about to be, the BMW X1 starts at $38,500 in Canada. It’s fitted with a 241-hp 2.0L turbo. The X3 (with similar power generated by a different engine) costs $3400 more, or $8400 more if you want the 300-hp powerplant. Though the X1 isn’t as awkward in person as it is in pictures, it’s still hard to imagine anyone buying it because it’s pretty. And strangely enough, there are plenty of good looks to go around in this segment, from the handsome GLK to the curvier Q5 to the edgy Land Rover Range Rover Evoque, soon to be introduced. 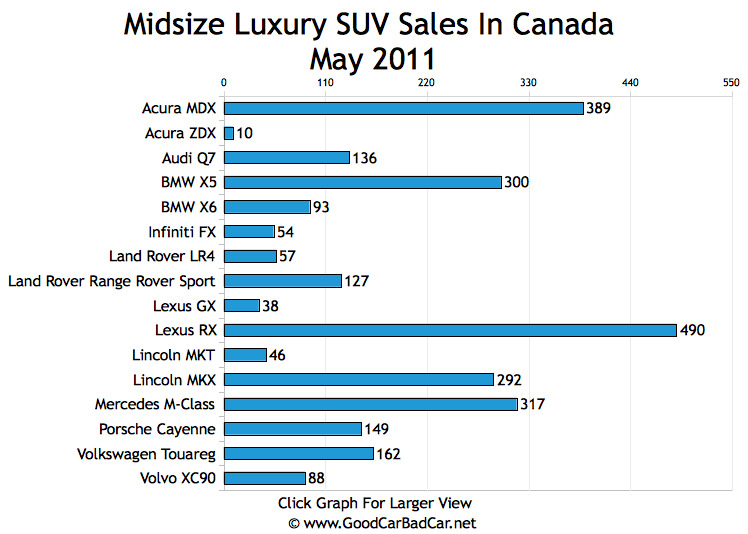 For a better-looking BMW SAV, check out the X5, 300 of which were sold in Canada in May. That’s down 21.1% from May 2010 levels. 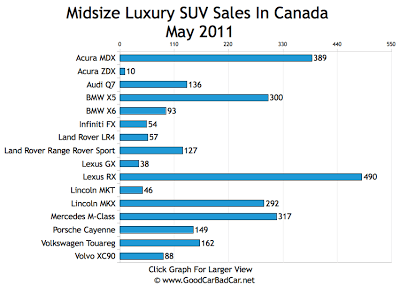 The dreadful BMW X6 found 93 buyers; down 6 units from May 2010. Audi Q7 sales, meanwhile, were up 44.7%, and Mercedes-Benz M-Class sales fell 6.2%. But those aren’t the only German players. Sales of the $48,440-$63,135 2011 Volkswagen Touareg jumped 195% and sales of its corporate sibling, the Porsche Cayenne, a Good 12 winner, rose at a 303% clip. Despite production and supply struggles, the generally more popular Japanese competition for these German vehicles remained more popular in May. Lexus RX sales plummeted 27.8% and Acura MDX sales plunged 23.6%, but nothing in the chart below topped them. By the way, 64 of those Lexus RX sales were of the RX450h variety. Sales of the hybrid luxury crossover were down 26.4% in May.